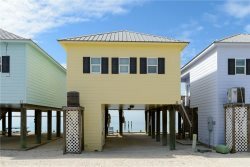 The Key of Sea - Beauitful Gulf Side Home which is only steps from the Gulf of Mexico. 4BD/4BA, Sleeps 10. Tile flooring, crown molding, granite counter tops and stainless steel appliances. Large open deck and covered areas. Sliding doors in great room 8'x 8' in bedrooms 8' x 6'8. Spectacular View of the gulf and sandy beaches.